we have prepared the new beta version of Tube Sites Submitter with some new features that you will surely like very much. In addition to the new features we have improved the upload speed and the stability of Tube Sites Submitter. And what’s new in the current version of Tube Sites Submitter? We have added a new feature that ensures a trouble free upload to Youporn.com. As you may already know Youporn.com is a tube site that requires watermark in the following format: domain.com/youporn. From now on it’s enough to create a subdirectory called ‘youporn’ in your video directory and place the youporn.com video into that subdirectory. The name of the video file has to be the same as the original video’s name (Video File under the Video tab). The Profile Folder under the first tab is an important feature. After setting it up all your upload results (screenshots) will be automatically saved into that folder on your computer, so they can be later analyzed. Many users did not set these parameters and did not had an overview about the tube site upload results. This is why we had made this parameter mandatory. Setting it up takes only a few seconds. Some of the tube sites have triggered various sounds effects during uploads ( automatic or manual ). This uncomfortable element during uploads has been solved and the sound has been turned off. Uploading to tube sites an authorization at tube sites will also work through HTTP Basic authorization ( Pop Up ). For a better orientation in processes, we have changed the name of the exe file that manages the upgrade of Tube Sites Submitter. It’s called tube-upgrade.exe from now. For requesting Tube Sites we have added the Add Tube feature that goes directly to the form, which is for adding new tube sites into the database. It’s enough to fill out this form and our staff will add the tube site into the database. In the new version of Tube Sites Submitter you can choose your own avatar, which will be uploaded to your profile during registration to tube stats. In the old version this was not possible. From now on you will be able to safely, quickly and easily backup your Tube Sites Submitter data on your computer. The backup feature will save a backup on your disk or at a location of your choosing. You can easily restore the Tube Sites Submitter’s database anytime when needed. In Tube Sites Submitter’s old version sometimes during manual upload this active window constantly appeared above the other windows. This has been fixed in the new version and these active uploads ( namely the windows where filling out forms or video upload was happening ) are now stacked under the other windows. This way these window won’t disturb during the upload process. The priority of these windows is set by you. In the steps 2 ( Register ) and 4 ( Upload ) under the upload or registration results a new item has been added to the context menu called Resubmit Failed. 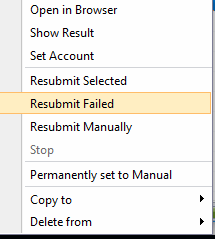 Just click on the Resubmit Failed ( to bring up the context menu right click using your mouse ) and all your uploads or registrations with Error, Failed etc. results will be added to the upload or registration process queue and will be ready for re-upload or re-registration. Click using the right mouse button for bringing up the context menu where you have two items to choose from: the first is SCHEDULE IMMEDIATELY and the second option is called CANCEL SCHEDULE. This allows you to collectively set and change upload statuses in the entire video list. CTRL-A marks all the videos in the list, right click brings up the context menu and you can select the function according to your will. In step 2 ( Register ) when you click on Clear/Delete at tube site account settings it will also clear the status – the result of registration. We have also fixed some minor bugs, and we have also fixed cookie deletion when submitting to partner tube sites. 1. Backup tube.exe and tube.db from the directory where you have Tube Sites Submitter currently installed. In case of problems, so you can return back to the original version. 2. Download the following file: https://secure.tubesitessubmitter.com/beta/Tube.zip unzip the file and overwrite the old exe file with the new unzipped one ( tube.exe ). Such an amazing tool. Great work guys!